Image 1. Color Infrared. Tractor and Disc Harrow. A photographic series is a set of photographs with a common theme. A photo series is often used to highlight a place, a purpose, or a condition, tell a story, evoke emotions, or document events. Images within the series are intended to be viewed both as a group and as individual photographs. 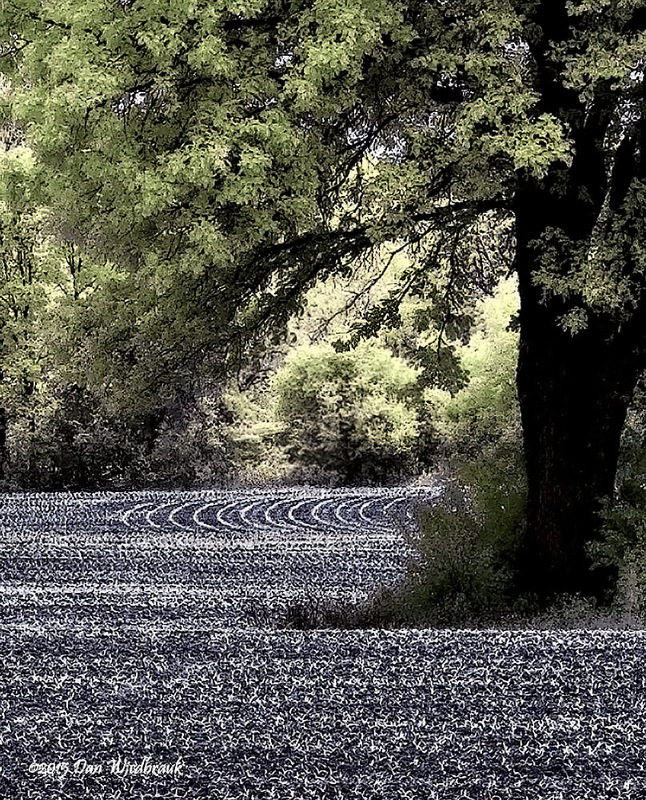 I’ve wanted to create an infrared photo series for a while because when I visit a place regularly, I see a wider range of possible images than I would normally find with a single visit. Subject familiarity also allows me to anticipate changes and challenges. 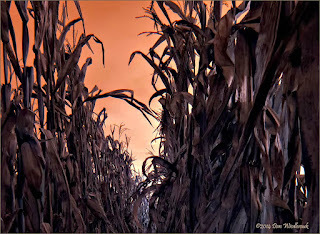 I chose to start with an easily accessible subject, cornfields. I pass by a number of farms and fields on my way to work and the cornfields are unfenced and readily accessible from the road. This was an important decision for me because I tend to be a procrastinator. Because I am in the area every day and the tripod is always in the car, my prep work consists of grabbing my infrared camera bag when I leave the house. My subject is close at hand so I can easily react to changes in weather and lighting conditions and it’s no great loss if I don’t take a single shot during the day. I intend to keep photographing these fields over several years. This will give me time to refine my photographic capture techniques and post processing. My ultimate goal is to have a few unique high-quality images that have their own voice and transforms a mundane subject into something visually appealing. 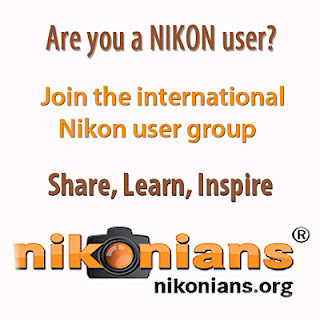 The purpose of this post is to share my thoughts about creating a photo series and to show some of my current images. These images may never make it into the final mix, but they represent where I am today. I’ll be posting more images in the future. Image 3. Newly planted field. Color IR. 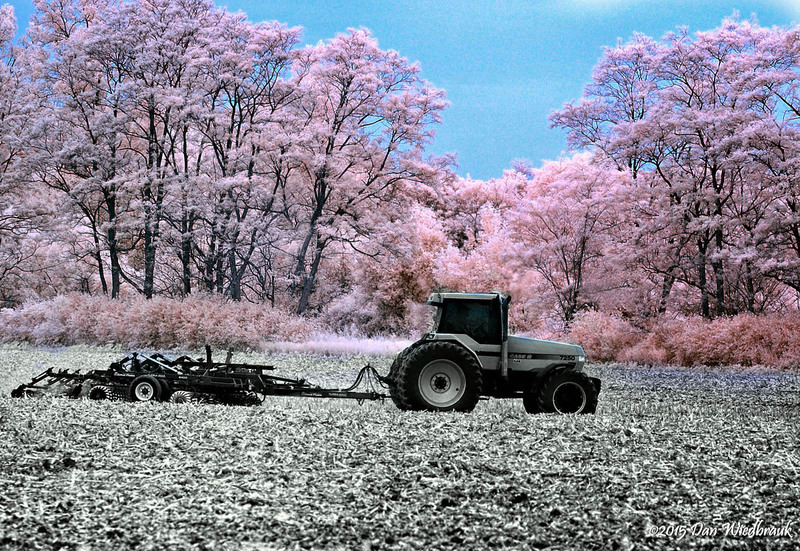 The first image shows a tractor pulling a disk harrow through the field. The window glass in the cab is treated so it appears opaque in IR. When looking through the viewfinder (visible light view), I was able to see the driver. Nikon D90, standard 720nm IR conversion, Nikkor 105mm f/2.8 VR, f/4, 1/1250 sec, ISO 200. Image 2. 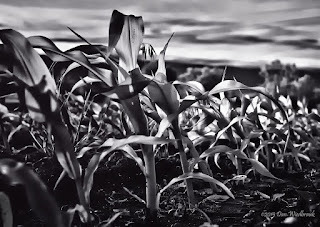 Newly planted cornfield. 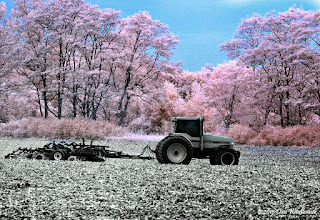 Color infrared with channel swap. The corn plants are only 1-2 inches tall. Nikon D90, standard 720nm IR conversion, Nikkor 105mm f/2.8 VR, f/10, 1/200 sec, ISO 200. Image 3. Closer view of the tree in the newly planted cornfield. Color infrared with channel swap. The corn plants are only 1-2 inches tall. Nikon D90, standard 720nm IR conversion, Nikkor 105mm f/2.8 VR, f/10, 1/200 sec, ISO 200. Image 4. 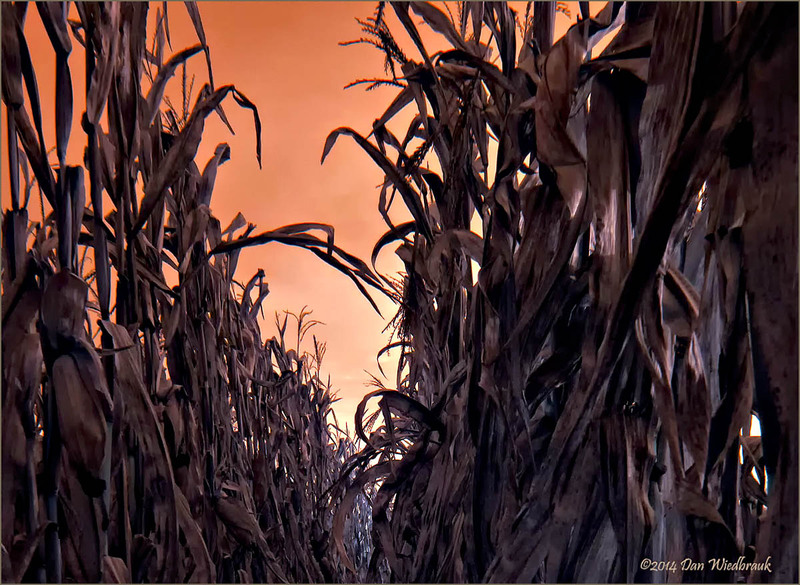 Young corn - Infrared. BW with Duotone overlay. Image 4. 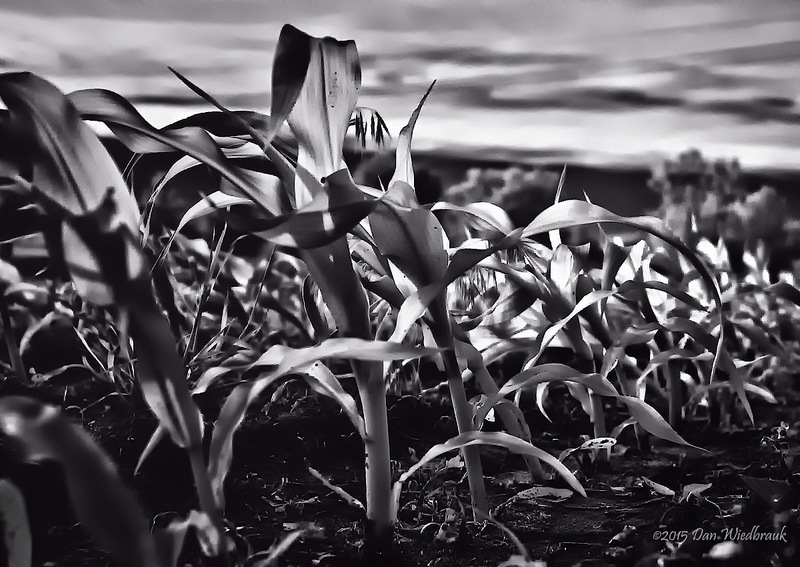 Short corn plants. Duotone image. Converted to black and white in Photoshop CS5 then converted to greyscale. A Duotone overlay was applied. 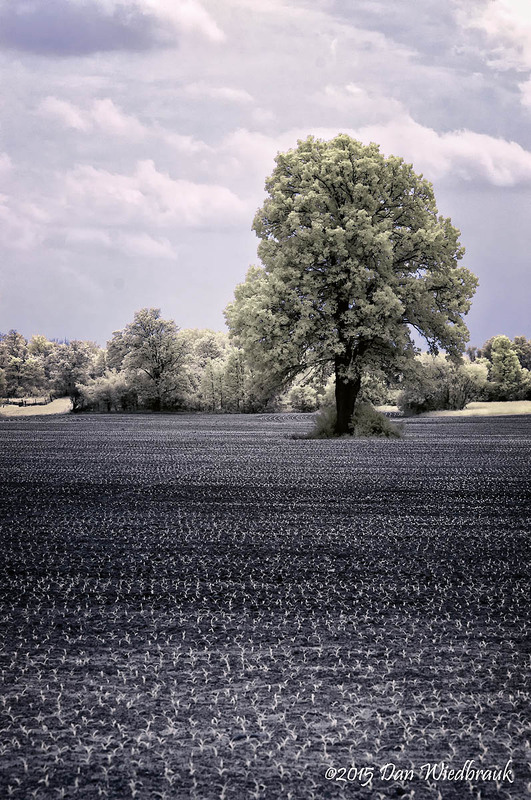 Nikon D90, standard 720nm IR conversion, Nikkor 20mm f/2.8 AFD, f/4, 1/3200 sec, ISO 200. I should have used a smaller aperture. Image 5. Mature corn. No channel swap. I took this a while ago. I captured this image with my 590nm supercolor camera. I wanted spooky shadows and contrast so I placed two flashes in the field to camera right. The first flash was fairly close to the camera and two rows over. The second flash was about 10 feet away in the next row. Used a cheapo radio trigger to activate the flashes. I shot several brackets and this was the keeper. Image 5. Mature corn with flash. No channel swap. I cannot tell you how strange it felt to be in a corn field on an autumn evening shooting exposure brackets with two SB800 flash units. Anyone driving by probably thought space aliens had landed. It was that kind of location. D90 IR (590nm conversion), Nikkor 20mm f/2.8 AFD, f/16, 1/160 sec, -4EV, ISO 400, handheld. Enjoyed this blog post Dan. As I've said before, always learn some new trick from you. Having an infrared camera bag, great idea! 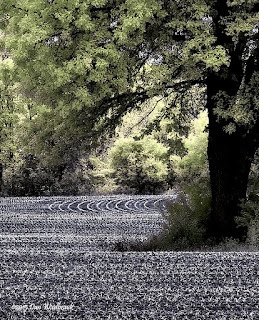 Your lens choice would be a natural for image 4, but not the others. Pleasantly surprised by the result. My favorite is image 3, beautifully dreamy composition. Image 5 is an old favorite, that I haven't had the courage to try. Maybe this fall.